The URL is bad or the website isn't working, or there's been sabotage. In any case, it doesn't open. This looks like more evidence of the depth and breadth of the global neoliberal assault on the public sector, with teachers the most visible (and visibly unhappy) group of public workers fighting back. My guess is that the public system there, like in Mexico and here in the USA (as elsewhere) has been wracked by disinvestment and demonization of the teaching force -- along with instituationalized racism that reinforces the underperfomance of schools in poor districts of color (and where indigenous groups are big). It would be good to post some overviews. I wish I could offer a more concrete suggestion, but one thing is for sure: there will be MORE demonization of teachers, MORE disinvestment and MORE attacks on unions from one country to another. None of it is an accident. I'm suspicious of this one. Why does it run counter to everything we're experiencing here? Why is the author's own rhetoric against the left so overwhelming? He builds a case, but without the necessary framework it sounds suspiciously right-wing. Is listening to reason to be equated with modern "reformism" because the left alternative is corrupt beyond question? The suggestion of a middle way is vague indeed--a stalling tactic? You don't negotiate with people holding you hostage, especially when you have more support than they have. Obama would do better to repeat over and over that the Republicans are holding the government hostage, are harming the economy and people, and the Tea Party types should be defeated in the next election. Period! Brilliant analysis by Hayden (summarizing Drew), should be a wake-up for many. How about a quick piece in Portside encouraging Portside readers to reprint the article and distribute it at the Oct. 5 immigration rights' rallies this Saturday? Suppose we all agreed to let the red states form their own country? I realize we fought a war to stop just that a while back, but times have changed. The New Confederacy would doom Roe vs. Wade, gut the Voting Rights Act, and make voter registration as difficult as possible, but if that's what its citizens want, then let them have it. The United States would benefit by ridding itself of a bunch of states that get back more Federal dollars than they contribute in taxes. More importantly, our armed forces would lose an important source of recruits, and lose some funding, due to the resulting reduction in tax base. Those losses would in turn reduce the United States' ability to play world policeman. What's the downside? That we need a tourist visa to visit Disney World? Re: GOP's Shutdown Debacle Resembles Our First - in 1879! This is not the first time a reactionary House of Representatives has attempted extortion to get its way. And it is the same non-confederate mentality wanting to go back to the "old ways. While one hopes that there current actions do prove politically suicidal to House Republicans, that hope seems faint. Toward national governance, they are the Extortion Caucus, and in material terms if they persist they will become the Homicide Caucus. "plus ACLU President, Susan Carleson!" That is wrong, she's the head of the ACRU, not the ACLU. The ACRU is a far right wing counterpart of the ACLU. Hi, this is Horst Schäfer from Berlin. Sorry to say this, but Andy Borowitz probably doesn't realize how close to reality this is. Most probably have no idea about what goes on in the rest of the world regarding health care. The Left Party wins seats because they have proportional representation. If we had such a fair election system here both Green Party and Peace and Freedom Party would each have several seats. All we have to do is create a democratic election system here in the good old U. S. of A.
I hardly see Die Linke's performance as a positive sign; the great hope coming from the merger of WASG and PDS in 2007 was that an effective all Germany party to the left of SPD would finally be possible. Unfortunately the election results tell a very different story, Die Linke is still a party of the old DDR, with little appeal in the wrest of Germany--and diminishing support even there. I am very saddened at the passing of General Vo Nguyen Giap on Friday! Bac Giap, as he is called as a term of great affection, dedicated his entire life to achieving the national liberation and independence of Vietnam. He led the victory of the Vietnamese people against French colonialism and U.S. imperialism, making Vietnam the first country to achieve decisive victories over colonial and imperialist powers. Bac Giap and President Ho Chi Minh together led the movement for national liberation and socialism which made these victories possible. Developing Marxism Leninism creatively and applying it to the particular conditions of Vietnam, they were able to meld the demands for national independence and ending feudalism and oppression into a powerful and all-sided people's struggle. Bac Giap developed a theory and practice of people's war -- an integrated strategy of military, political and diplomatic mobilization of the entire Vietnamese people. This unique comprehensive approach maximized the agency of the Vietnamese masses in achieving their own liberation, mobilizing their grass roots initiative. Some bourgeois press obituaries of General Giap have claimed that he was "ruthless," willing to lose millions of people to win Vietnam's independence. Those who write this clearly do not understand Bac Giap or the Vietnamese people! The French colonialists and U.S. imperialists' scorched earth war against the Vietnamese made the fight for liberation burn in the heart of the people, who were willing to make incredible sacrifices to achieve their liberation. Bac Giap successfully led this movement with great love and respect for those he commanded and his love has been reciprocated. The massive outpouring of people, including many youth, this weekend in the streets of Vietnam to honor Bac Giap underscores how beloved he is in Vietnam, as he is around the world. In an interview he gave in 1999 with PBS, Bac Giap summed up some of the lessons which the world has drawn from his life of service to humanity, There is a limit to power. I think the Americans and great superpowers would do well to remember that while their power may be great, it is inevitably limited.... Since the beginning of time, whether in a socialist or a capitalist country, the things you do in the interests of the people stand you in good stead, while those which go against the interest of the people will eventually turn against you. History bears out what I say. I met Bac Giap and his wife and comrade, Dang Bich Ha, several times over a number of years from the 90's to 2005. The first time, I was immediately struck by his kindness and his humility. As I shook his hand, somewhat awestruck, he waved his hand and stopped me when I started to say how honored I was to meet him, He said that he had come to hear my thoughts, and the thoughts of our movement, about the situation in Vietnam and the U.S. He asked me to tell him about the communist and left and anti-war movements in the United States, about how people here viewed Vietnam and about what we thought of the current situation of the Vietnamese revolution. He was particularly interested in how young people in the U.S. understood the situation in Vietnam and the about basis for long term friendship and solidarity. Bac Giap told me that about his research and investigation into the living conditions of the peasants, land use issues and his desire to ensure that they were able to improve their lives and prosper as Vietnam developed. He expressed concern for Vietnam's workers, saying that in a socialist country, particularly in this stage of development, policies must focus on the well-being of the majority- the workers and peasants. In a later meeting, we spoke about socialism and about the challenges of political education of youth. Bac Giap was always hopeful, even when acknowledging the contradictions that development brings. I was also privileged to spend some additional time with his wife, Dang Bich Ha. Bac Ha is a strong revolutionary woman who took part in all the discussions and raised many questions about the communist movement in the U.S. Bac Giap and Bac Ha's relationship impressed me as an expression of the Vietnamese revolution's emphasis on the equality of women from the earliest days. It struck me as a marriage of love, equality and respect, with common beliefs as well as lively discussions and even some disagreements! In my final meeting, General Giap spoke mainly of his activities in the revolution against the French and his work together with President Ho Chi Minh. At that time, he was resting in Do Son at a very modest Army house. His body was becoming frail, but he still managed to climb a flight of stairs to meet with a large group of soldiers who had come to visit bearing flowers and great enthusiasm. With the young soldiers Bac Giap radiated energy and warmth, making everyone feel comfortable. I will always remember Bac Giap, Bac Ha at his side, among that group of young men and women with their eyes shining! The obit of Gen. Vo Nguyen Giap doesn't mention he was a communist for over 80 years. Why did you run something that left such an important fact out. The Permanent Mission of the Socialist Republic of Viet Nam to the United Nations, with profound grief and sorrow, regrets to inform about the passing away of General Vo Nguyen Giap, on 4th October 2013, at the age of one hundred and three. In his eighty years of distinguished service for the country, General Giap had been a Member of the Politburo and Secretary of the Central Military Committee of the Communist Party of Viet Nam, First Deputy Prime Minister, Minister of Defense and Commander-in-Chief of the People's Army of the Socialist Republic of Viet Nam. A book of condolences will be opened at the Permanent Mission of Viet Nam to the United Nations at 866 United Nations Plaza, 4th Floor (Suite 435), New York, from 9.30 am - 5.30 pm on Friday, 11th, and from 10.00 am - 12.00 pm and 2.00 pm - 5.00 pm on 12thOctober 2013. Re: How Many Die From Medical Mistakes in U.S. Hospitals? I do not think focusing on patient safety contributes to patient safety. It will only result in increased bureaucratization and increased defensiveness by hospitals & doctors. Probable results: increased medical error, in creased patient suffering, increased cost of health care. Medical errors are not, as it were, the result of medical errors. They are the result of a profit-based system of health care. They will continue to increase until that system is eliminated. I applaud the responses of Phyllis Bennis and David McReynolds to Danny Postel's commentary, "Mission Accomplished." (October 2, Portside) I agree with every word I would like to expand a bit on one matter that Phyllis Bennis raised, that of the internationalism of Saul Landau. Danny Postel identifies Saul as an exemplary "New Left Third Worldist" who supported "emancipatory movements and leaders," drawing a parallel with his own point of view toward how solidarity is practiced as well as his criticisms of the U.S. antiwar movement. I doubt that Danny Postel would have attributed his own thinking to Saul Landau had Saul been alive to answer him, which I find opportunistic and shameful, because it is so wrong. It's unimaginable that Saul would have called for U.S. military intervention or arming of the FSLN in El Salvador, beyond imagination. But, that is what is implied, that were Saul alive he would support U.S. military intervention and arming of the Syrian opposition. Secondly, in regard to Saul Landau's practice of international solidarity with liberation movements in his films, writing, teaching, and actions, the Cuban Revolution was always at the core. Danny Postel conveniently leaves Cuba out of his appropriation of Saul Landau's politics. For his entire political life, Saul visited and revisited the Cuban Revolution, and during the last fifteen years of his life, he was involved in freeing the Cuban Five. His final film (2012) was Will the Real Terrorist Stand Up, about the Cuban Five and the decades of U.S. attacks on Cuba. I believe this omission is a further indication of Danny Postel's bad faith in using Saul Landau, while castigating Phyllis Bennis, whose view of international solidarity is identical to Saul Landau's. Mentioned by name are Russia and Iran as suppliers of arms to Syria, but no mention "by name" of all those supplying the rebels with arms. I could go on and on over the my points of disagreement, but I'm shocked at how radicalized Chris Hedges has become. It's a good sign! We are pleased to invite you to join us for a Labor Breakfast Forum called "A Back-room Deal for the 1%: The Trans-Pacific Partnership." The forum will be held on Friday, October 25th, from 8:30 to 10:15 am, at the Murphy Institute, 25 West 43rd Street, 18th floor. The Trans-Pacific Partnership (TPP), a massive trade and investment agreement now being negotiated between the U.S. and 11 countries around the world, dwarfs NAFTA and other agreements-not only in its economic scale but also in its potential to undercut wages and worker rights worldwide. Designed to make it easier to locate jobs in emerging lower-wage nations like Vietnam, the AFL-CIO projects the deal to jeopardize millions of domestic jobs and exert a severe downward pressure on worker compensation globally. Making matters worse, there are currently no indications that any of the "partner" countries are supporting labor rights clauses that would, among other things, make International Labor Organization (ILO) conventions enforceable. The deal is also being deliberated in secret, reviewed by cleared "advisors" representing transnational corporations and industry lobbies such as Walmart, Cargill, Chevron, and the US Chamber of Commerce. Hoping not to fight another rear-guard action on trade, the labor movement moved quickly with the Obama administration to hammer out an alternate trade agreement it could support. Yet on-going TPP negotiations have left organized labor largely on the sidelines. This fall, the issue is reaching a critical point as the administration seeks Congressional approval for Fast Track authority-which would allow the TPP to bypass ordinary Congressional review, amendment and debate. Join with featured speakers Arthur Stamoulis, Executive Director of the Citizens Trade Campaign, and Celeste Drake, trade and globalization expert at the AFL-CIO, to learn more about the vast scope of the proposed agreement; its likely impact on jobs, workers, and the environment; and what actions can be taken to democratize trade deals and defend workers' interests. We hope you will join us on October 25th to address this urgent issue. Please rsvp to Eloiza Morales at 212-642-2029 or via email at Eloiza.morales@mail.cuny.edu. A gifted singer, writer, activist, guitar string buster, and Emmy award winner, Jon passed from this life on January 2, 2013 at the age of 66. 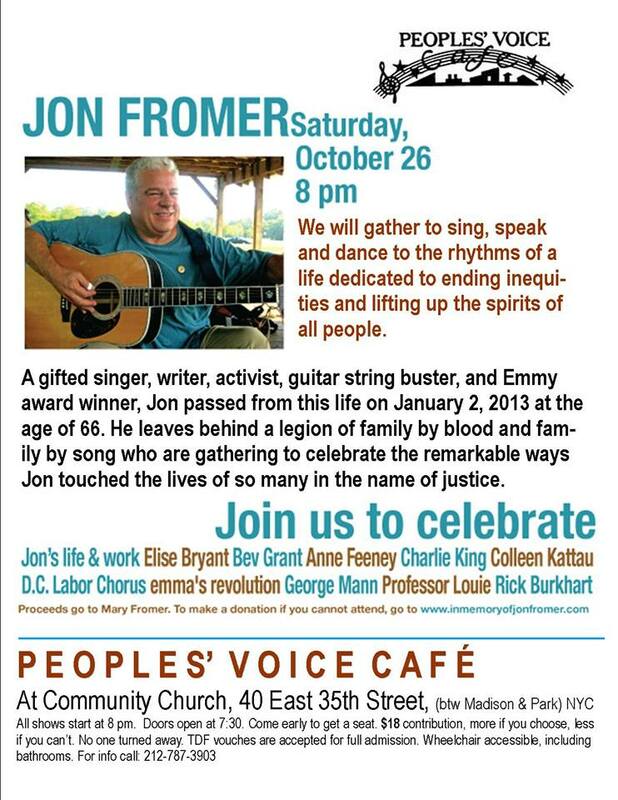 He leaves behind a legion of family by blood and family by song who are gathering to celebrate the remarkable ways Jon touched the lives of so many in the name of justice. 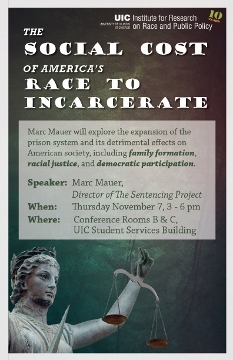 Marc Mauer, of The Sentencing Project, will explore the four-decade expansion of the prison system and its wide-ranging effects on American society. As the U.S. has entered an era of mass incarceration, the effects of these policies are increasingly profound for family formation, racial justice, democratic participation, and the development of an effective and compassionate public safety strategy. Beatlemaniacs worldwide are remembering the 73rd anniversary of the birth of John Lennon (1940-1980) and visiting the places where he left his mark, while here in Havana, Cuban rock bands will meet to reprise his songs. Old and young alike will dedicate their musical tribute to the author of "Imagine" at the "Submarino Amarillo" (Yellow Submarine) nightclub in Havana, near the park where the statue of Lennon designed by Cuban Jose Villa Soberon, is located. The groups Miel con limon, La Vieja Escuela, Challenger and Lissy project will sing several hits composed by Lennon such as Give Peace a Chance, Come Together, Get Back, and I Wanna Hold Your Hand. John Winston Lennon was born on October 9, 1940 and many people consider him the driving force behind The Beatles, mainly responsible for its emergence in 1960, and its breakup at the end of that decade. After the dissolution of the group, Lennon rarely returned to the stage, but the excitement over the release of his Double Fantasy album was short-lived. On December 8, 1980, a deranged fan shot and killed him on the sidewalk outside his New York apartment. A majority of staff members at Chicago Public Media signed a petition requesting union representation and presented it to CPM interim C.E.O. Alison Scholly Sept. 25, according to the broadcast union SAG-AFTRA, which seeks to represent staffers through its Chicago chapter. "The petition asks CPM management to recognize SAG-AFTRA as their representative and begin negotiating a contract that sets standards for their pay, benefits and work conditions," Leslie Simmons, assistant national director for communications at SAG-AFTRA, said in a news release. Simmons declined further comment. But the Oct. 1 shutdown of the federal government delayed their organizing movement. The National Labor Relations Board, which must approve the unionization request, is not accepting new case petitions because it is considered a "non-essential" federal agency. SAG-AFTRA already represents public media employees at NPR, San Francisco's KQED-TV/FM, New York's WNYC and elsewhere. Its Chicago-area chapter includes bargaining units at pubTV station WTTW, as well as commercial outlets such as WGN-TV, owned by the Tribune Company. CPM management declined to comment on a personnel matter. Maintaining CEPR's websites, including daily posting and content management, security upgrades, troubleshooting, server maintenance and improving the main site's current CMS (Joomla!). Updating, designing, and ensuring a user-friendly and easily navigated site. Managing CEPR's online "public face" though the organization's website and through social networking tools, including Facebook, Twitter, Tumblr, etc. Maintaining and, when appropriate, improving the website's layout and design. Upgrading website as technology allows. Organization Description: The Center for Economic and Policy Research (CEPR) was established in 1999 to promote democratic debate on the most important economic and social issues that affect people's lives. It is an independent, nonpartisan think tank based in Washington, DC. CEPR conducts the highest quality research in an effort to inform the media, policy-makers, and advocates working on economic issues. Demonstrated experience using social media tools for organizing or advocacy. Familiarity with the integration of multimedia including podcasting, streaming video, maps, and charts into standard web design. Experience building components/modules for Joomla! and WordPress. Familiar with version control via GitHub. Salary & Benefits: CEPR offers a competitive salary and an excellent benefits package. This position will be represented by the International Federation of Professional and Technical Engineers, Local #70, AFL-CIO. To Apply: Send resume, cover letter, examples of websites you have designed/managed, and salary requirement to jobs@cepr.net. No telephone calls or faxes please. CEPR is an equal opportunity employer that considers applicants for all positions without regard to race, color, religion, creed, gender, national origin, age, disability, marital or veteran status, sexual orientation, or any legally protected status.